Happy Halloween! The holiday has long been associated with cats but, unfortunately, some of those connotations are negative. 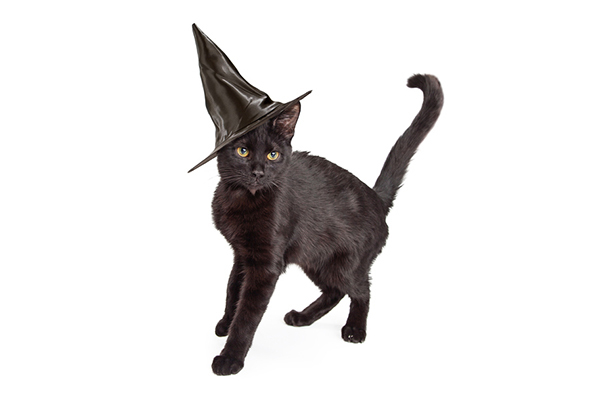 Let’s look at some particularly scary and untrue cat superstitions and myths — as well as some lucky cat superstitions. Cleo. Photography courtesy Layla Morgan Wilde. Photography by Jay Bondelli, volunteer shelter photographer who contributed the cover images to the Black Cats Tell All book and the Black Cats Tell All calendar. 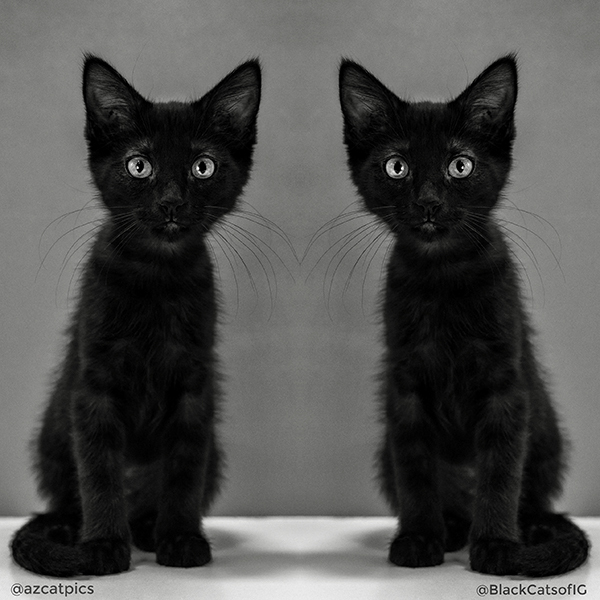 instagram.com/azcatpics; instagram.com/blackcatsofIG. The negative stereotypes may be centuries old, but they still unfairly impact black cat adoption. In addition to her book, Wilde founded Black Cat Awareness Month in October (Halloween season) to further the message about black cat adoption. While the absence of cat-faced children proves that this legend is untrue, another more modern myth says that pregnant women shouldn’t have cats for fear of catching toxoplasmosis, which may cause birth defects. This is also false! For starters, toxoplasmosis is rare in indoor cats and it’s even rarer to catch it if you take simple measures like washing your hands or getting another friend or family member to clean out your litter box. Another wildly untrue superstition, this myth stems from the thinking that cats are attracted to the milk that babies drink (we now know that cats shouldn’t even be drinking milk unless it’s kitten milk or from their own mothers, another myth!) and get jealous of all the attention. According to Live Science, the superstition appeared in writing back in 1791. The Annual Register recorded that an 18-month-old child in Plymouth died because of “a cat sucking its breath, thereby occasioning a strangulation.” In modern times, this unfortunate condition is known as sudden infant death syndrome, or SIDS, and it has nothing to do with cats. Going along with the untrue and outdated belief that cats were evil, Europeans blamed the Black Death in the 14th century on cats. This unfortunately meant the widespread killing of cats and, sometimes, their owners. Getting rid of cats was ironic because, according to Mental Floss, the Oriental flea, which lived on rats, was the real perpetrator of the plague. With fewer cats to kill these rats, the plague decimated up to 60% of the population in some places. Talk about the nightmare before Christmas — and one of the more ridiculous cat superstitions out there. According to Mental Floss, Jólakötturinn, the Yule Cat, is a kitty who patrols Iceland’s cold countryside in the winter, looking for humans to snack on. What fuels his appetite, you ask? Poorly dressed people. Farmers spread this story as a way to encourage workers to finish processing wool on time so that Jólakötturinn didn’t gobble up any fashionably challenged folks. The craziest part — this tall tale isn’t even that old. It first appeared in the 19th century but really took hold in the 20th century. Thumbnail: Photography ©adogslifephoto | Thinkstock. Black cats are among the most Beautiful Creatures on earth, there is nothing more beautiful than a sleek glossy black coat. They are just as loving and devoted as their coloured friends. I worked for a long time in cat rescue and constantly saw the overlooking of these beautiful animals just because they were black coated. Come on everyone it’s 2018 let’s show that these stupid old wives tales are ridiculous. Please consider adopting a little black panther into your life. whats wrong with a cat-shaped birthmark! lol!